Anyone else out there feel pressured to create grandiose, public declarations of change each year? It can be exasperating. And if someone catches you not living up to yours within the first nanosecond, you feel like a complete failure. I get it. I’m with you. Resolution haters, unite! Ok, now let’s snap out of it for a minute and look at it from another angle. What if we set ourselves up for success to begin with? What would that look like? What if resolutions didn’t have to be scary? What if we could even get excited about them? The last few years I’ve heard more and more people zeroing in on a word of the year to motivate them. Seriously? I can’t even map out one resolution and you want me to settle on ONE WORD? Who makes this stuff up anyway? Pssshhh. Ok, snapping out of it. Again. Frustrated and weary, without a resolution or even a word for that matter, I turned to God a few years back. “What is it that you want for and from me in the New Year?” I figured that was a good place to start. After earnestly seeking Him, it wasn’t a word or even a set resolution that came to me. It was a verse. That year, and every year since then, God has placed a focus verse on my heart that, in some cases, has spawned certain resolutions. I still need help sticking to those resolutions, but now I feel better equipped to do so with a verse to go back to that points me to the “why” of the resolution. I know so many people who have an incredibly hard time sticking to their resolutions for a number of reasons. So, here are some excellent tips I’ve picked up along the way on how not to quit your New Year’s resolutions. “Commit your way to the Lord, Trust also in Him, And He shall bring it to pass.” Psalm 37:5. If we are in Christ, who is a bigger cheerleader for us than the One who made us and calls us His own? If our resolutions, goals, or whatever we want to call them are good for us, He is the one who can empower us to accomplish them. Are they specific, measurable, achievable, relevant, and timely? Specific: “Lose weight” is entirely too vague. “Lose 30 pounds” is much more specific and actionable. Measurable: “Lose 30 pounds” is still vague, though. “Lose 30 pounds in 90 days” is a measurable goal. Achievable: 30 pounds in 90 days may not be achievable, depending on how you plan to lose the weight, etc. Perhaps you need to give yourself six months to attain this sort of goal. Timely: If you’re too vague or give yourself too much time to achieve this goal, you’re less likely to stick to it, especially if you don’t see enough short-term results. They say it takes 21 days to create a habit. Whatever it is you set your mind to do, make it a habit. If your goal is to write a book in one year, set your alarm for a specific time of day and commit to writing a certain number of words in the allotted time. I thrive on routine, but some people are much more spur-of-the-moment. Setting a routine can help just about anyone achieve their goal. “Therefore, confess your sins to one another and pray for one another, that you may be healed. The prayer of a righteous person has great power as it is working.” James 5:16 (emphasis added). We were designed by God to live in community, not to do life alone. To be successful in life, especially when goal-setting, it’s best to have authentic accountability. Someone who is there rooting you on, but also calling you out, in love, when you’ve veered off track. Someone who can lift you up in prayer along your journey. Perhaps it’s more than one person. Joining a group fitness class can be a great way to encourage others and hold yourself accountable in the process. Someone is sure to notice if you’ve missed the last three weeks! If your resolution, for instance, is to read 50 books this year, you’ll likely find it hard to accomplish this if you live in a noisy apartment building, work in a noisy office, and commute back and forth on a noisy train. Finding the right space can be key to sticking to certain goals. You can get overwhelmed in a hurry if you set way too many resolutions, especially if more than one is a fairly lofty goal. I know when I feel overwhelmed in any area of life, my tendency is to just shut down. Set yourself up for success by choosing just one or two goals for the year. If your goal for the year is to become debt free, that’s great! To do so in one month? Likely not realistic, unless you have next to no debt. 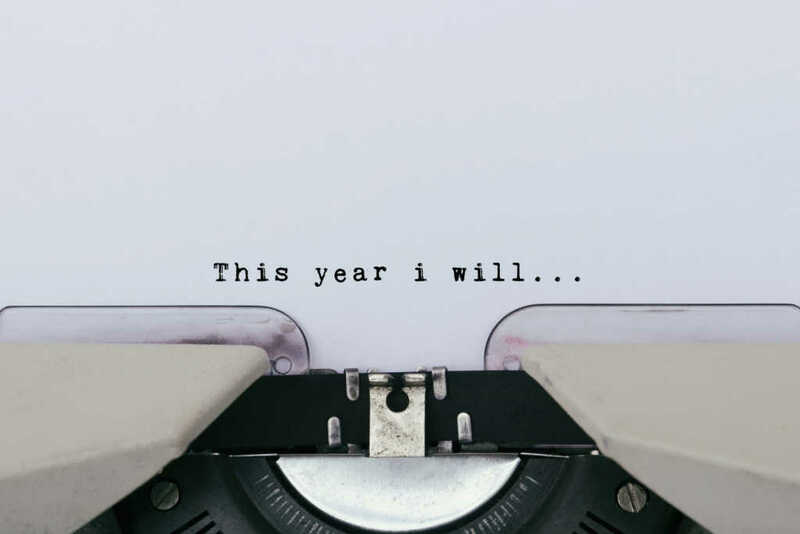 Resolutions require changes in behavior, so if you aren’t confident you can achieve your goal, perhaps it’s too lofty and you need to reevaluate and set a smaller, more manageable one. Again, set yourself up for success, not failure. A great way to not only set a goal but track your progress along the way is to journal. By putting your resolution in writing, you’ve made yourself accountable. By recording your progress, you give yourself hope that changes are happening. I’ve even seen people write relatable, inspiring scripture verses on paper and post them throughout their house as a reminder to keep on keeping on. Of course, nobody sets out to fail. You just can’t be afraid of it. Let’s say your goal is to complete a marathon by the end of the year. So you fall off the wagon and don’t run for a month. Is the dream over? No! There are very likely still running plans to help you reach your goal in the remaining time you have until race day. You just need to reset and refocus. Now, if you severely sprain an ankle and aren’t physically able to run the race, then it’s simply time to set your mind on a new goal. What are some of your New Year’s resolutions for the New Year? How can we lift you up in prayer? Florida-based Christian Care Ministry operates the Medi-Share health care sharing program through which members voluntarily and directly share each other’s medical bills. Since the program’s inception in 1993, Medi-Share members have shared more than $1.8 billion in medical bills. And because of access to an extensive network of more than 700,000 health care providers, members have saved an additional $1.1 billion in medical costs during that time. Medi-Share has over 400,000 members in all 50 states. More than just healthcare, Christian Care Ministry is a community of people who share their lives, faith, talents and resources and pray for and encourage one another. For more information, visit https://www.medishare.com/.Facebook: https://www.facebook.com/MyChristianCare. Twitter: @ccm_medishare. Instagram: medi_share.